Are Schwinn Bike Helmets Good? Heather Steele is a nutritional sciences graduate from the University of Oklahoma. She is a nationally registered dietitian and medically licensed. Steele currently practices dietetics in multiple public school systems promoting healthy eating, exercise and well-being by providing nutrition educations. 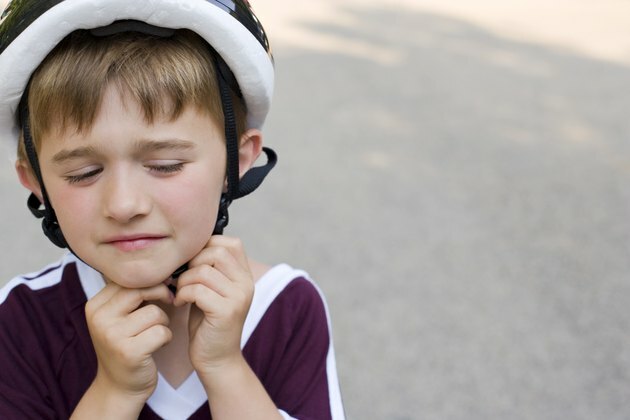 One of the most important pieces of equipment you can wear when riding a bike is a helmet. According to The National Highway Traffic Safety Administration, a helmet is the single best way to prevent a head injury resulting from a crash. Schwinn produces helmets that are safe and effective in multiple designs. When purchasing a helmet look for a sticker that lists "CPSC," or Consumer Product Safety Commission. The CPSC requires all helmets that are made in the United States pass all testing standards to verify the safety of your helmet. All Schwinn helmets carry the CPSC verification. It is recommended by Schwinn to purchase a helmet that fits properly in order for the helmet to work properly. Helmets are made in almost every color, shape and size to fit your personality. But it is vital to verify that your helmet is not designed just for looks but to best protect your head. Avoid helmets with features that limit your protection. Excessive vents contain less foam to cover your head, concentrating the force onto one spot, rigid visors can snag on pavement or shatter verses detaching itself and a shape that is not flat and rounded could snag and cause uneven force to your head.